Perhaps the most important thing to know about facing an unplanned pregnancy is that you have choices. Ultimately, the answer depends on you. Take a look at where you are in your life at this time, evaluate what your goals are, and what your hopes are for your baby. By doing this, you can begin to understand what choice is right for you. No one else can make this decision for you, but there are people to help you along the way. Are you financially able to raise a child for 18+ years? Is your home a stable and secure place to raise a child? Is the father currently involved in your life? Is he willing and able to provide financial support? Do you have friends and family who are available to help you care for this child? Are you willing to put your education and/or career on hold? Are you feeling pressured into a decision regarding your pregnancy? Try to be open and truthful with your answers. Set realistic expectations for yourself, and what may come your way. Assess where you are now, and where you would like to go. 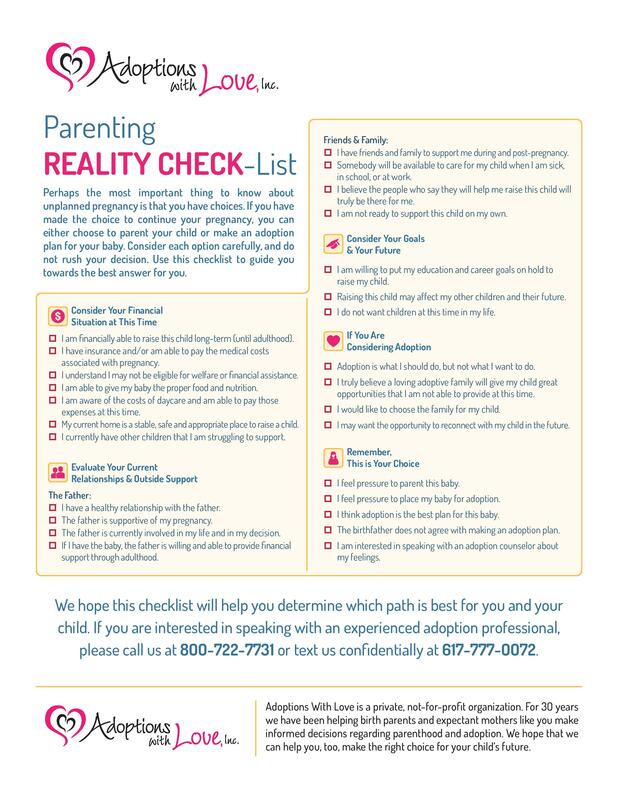 Print and complete the checklist to guide you. Once completed, review your answers and evaluate what they mean to you. Do you notice any patterns? Can you draw any conclusions? You may decide you want to discuss your answers with a counselor or an adoption professional. Please do not hesitate to contact us at 1-800-722-7731. Amy, Nancy, Amelia, and Claudia are available at any time of day to answer your phone call. We can offer you more unplanned pregnancy help, discuss your options further, or help guide you through your next steps. No matter what you decide to do, we will support your choice.